Armenian hospitality calls for a table overflowing with treats. Whenever I am planning a menu, my sister’s voice resonates in my head, “Don’t test new recipes on your guests.” We live within walking distance of excellent bakeries, yet, I insist on making things myself. Baking is so relaxing. I am forever looking for a reason to bake. Sometimes I even invent one, especially for Lemon Poppyseed Cake. Luckily, we had guests coming to visit. I asked for a favorite cake idea, expecting to hear chocolate cake. 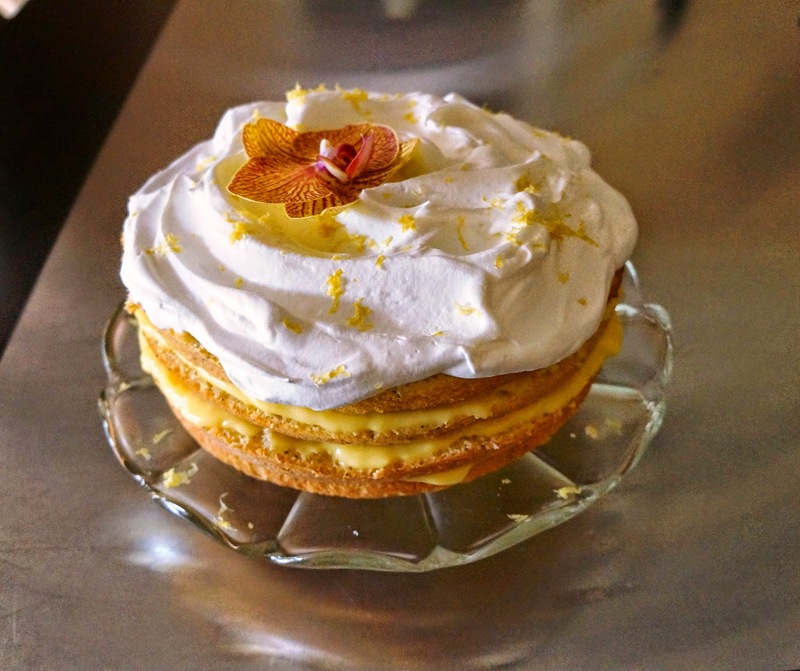 Then this happened…Lemon poppyseed with champagne custard filling and real whipped cream frosting dusted with lemon zest!!! Suddenly, the air around me stood still and I could not breathe. Champagne custard? Both stunned and impressed, I cursed myself for a moment, then came to my senses and started thinking hard. The bad news was I had never even tasted champagne custard. The good news was that I knew my bubbly and still had plenty of time. 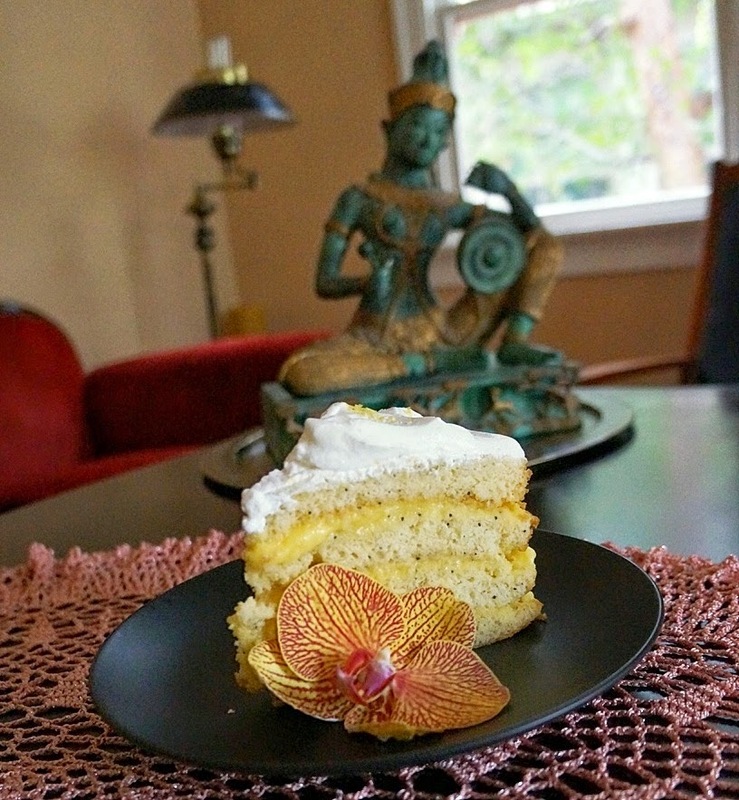 Since our guests were well-traveled, this cake had to make a lasting impression. After scouring every corner of the www, nothing turned up. So I hit the books. We have a LOT of cookbooks, none of which, not even my treasured Parisian bakery one mentions a word about champagne custard. So, I called the expert. Mom to the rescue! Every day, at 10 am, I call my parents for a quick hello. 10 am is traditionally the time for Armenian coffee at our household. Today’s order of business was this recipe. Mom suggested revamping one of her trusty napoleon cremes to fit the bill. Baking is an exact science and carries a challenge in that you cannot sample and adjust the taste the way you can savory dishes. Even with a solid recipe, things can go wrong and you will not know that until you have already placed that first slice in front of your guest. Or course, any excuse to bake is a good excuse to bake. Phase I of the test resulted in a moist, lemony cake that went to the office. The custard was a cheater’s delight, just instant vanilla pudding bloomed with cold milk, topped with homemade whipped cream, lemon zest and fresh blackberries. 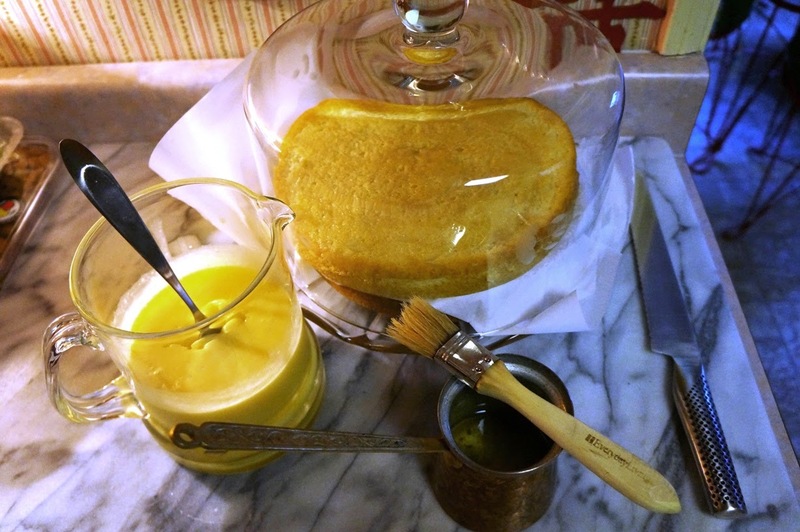 The secret to its success may have been the simple syrup made with the lemon juice and sugar, brushed over each layer. Cake #1 left everyone smiling and humming for the rest of the day. Phase II entailed creating the champagne custard from scratch, which was oddly a bit intimidating. Armed with two of my mom’s vanilla custard recipes and a bottle of lovely Sofia, I knew I had a winner. 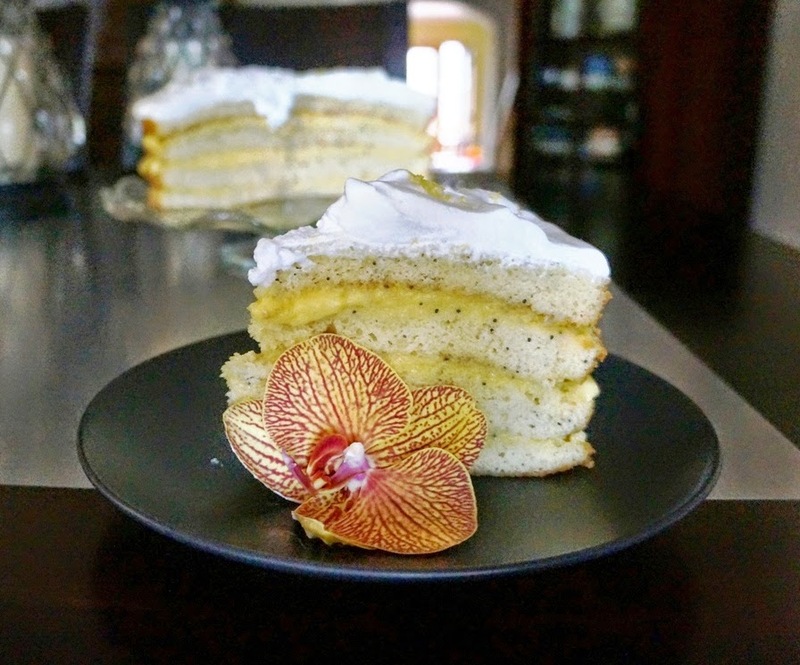 The result was an airy cake wrapped in lemony fragrance, creamy layers, crowned with a pillow of fresh whipped cream, as pretty to look at as it was a reward to eat. Our guests agreed. Little Miss Daisy could not stop eating it and even Shawn, who is normally not very vocal about my baking, would not let me give the leftovers away and, instead, resorted to more frequent 100-mile bike rides. The instructions look lengthy, but are designed to maximize your time if you intend to make everything at once. This recipe can easily be done in stages. The custard and lemon syrup can be made the night before. There are two choices for the custard: Decide whether you have the time to make the it from scratch (#1 needs about 15 minutes) or need to take the quick route (#2 needs about 15 seconds). This recipe makes 2 round 9-inch cakes, which can also be made ahead of time, but be sure to keep them under cover to retain their moisture. Use a sheet of parchment paper to separate the two until you are ready for the final assembly of the 4-layer cake. Read through the recipe to get a better feel for what to do. This isn’t rocket science. I have already made this cake twice in the last week and plan to make one for my parents tonight! Note: Stevia is a natural sugar substitute for your diabetic guests. It is 300 times sweeter than sugar. So a little goes a long way. Adjustments are provided in the recipe in case you would like to use it in place of sugar. Butter and flour two 9″ round cake pans. Heat milk + butter in a small pot on low heat. After the butter has melted, remove from heat. Beat eggs in stand mixer with paddle for 4 minutes. Set the kitchen timer to 4 minutes. Sift flour, baking powder & salt together into a clean bowl. Set aside. Reset the timer for another 4 minutes and add sugar. Beat until creamy. Add the sifted dry ingredients a bit at a time and mix just long enough to incorporate. Add cooled milk and butter mixture, then the poppy seeds. Divide batter between the two prepared cake pans and pop into the warm oven. Bake until fragrant, maybe 35 minutes. 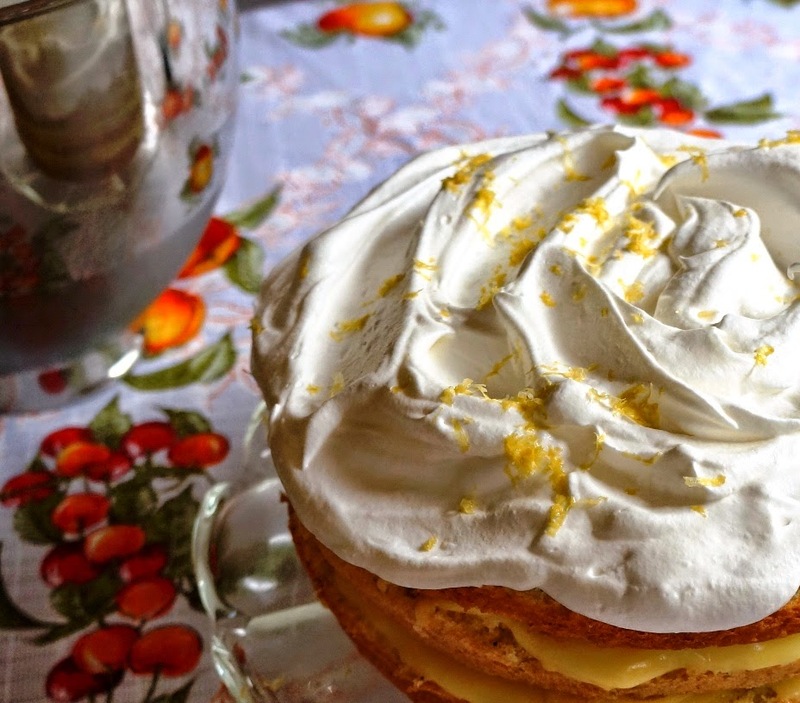 While the cake is baking, make the lemon syrup. Grate the zest of one lemon. Reserve for use later. Juice the lemon into a small pot. Add 2 Tb sugar, heat on low just until sugar is melted. Beat eggs, add sugar. Mix all until well combined. Add flour and mix gently. Cover and chill. Remove from fridge and add champagne. Cover and return to fridge until ready to assemble the cake. Insert a clean toothpick into the center of each cake. If the toothpick comes out clean, the cake is ready. Remove from oven and allow the cakes to rest at room temperature for 10 minutes. Then, turn them onto a metal rack to finish cooling. Using the stand mixer with the whisk attachment, whip heavy cream until stiff peaks form. Slice cooled cakes in half horizontally. Place one layer of the cake onto a pretty plate. Brush the top with lemon syrup. Spread about a 1/3 of the custard over the cake, and set another layer of cake on top. Repeat syrup and custard process until the last cake layer is placed on top. 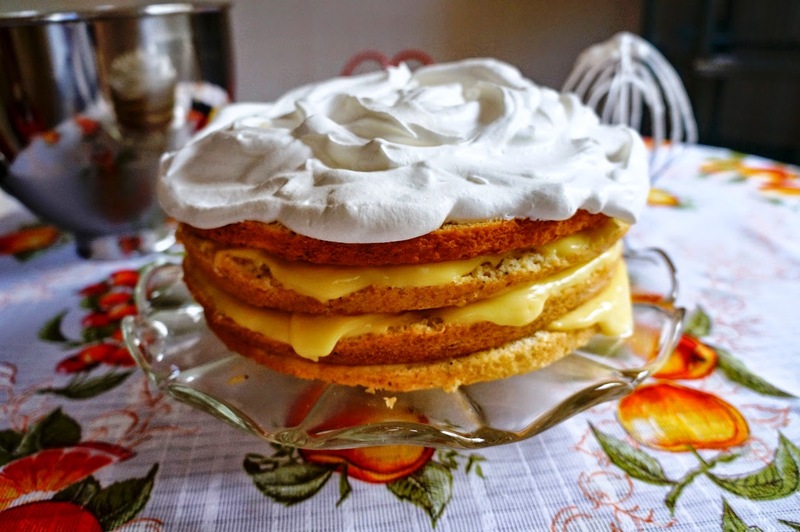 Brush the top layer of cake with lemon syrup. 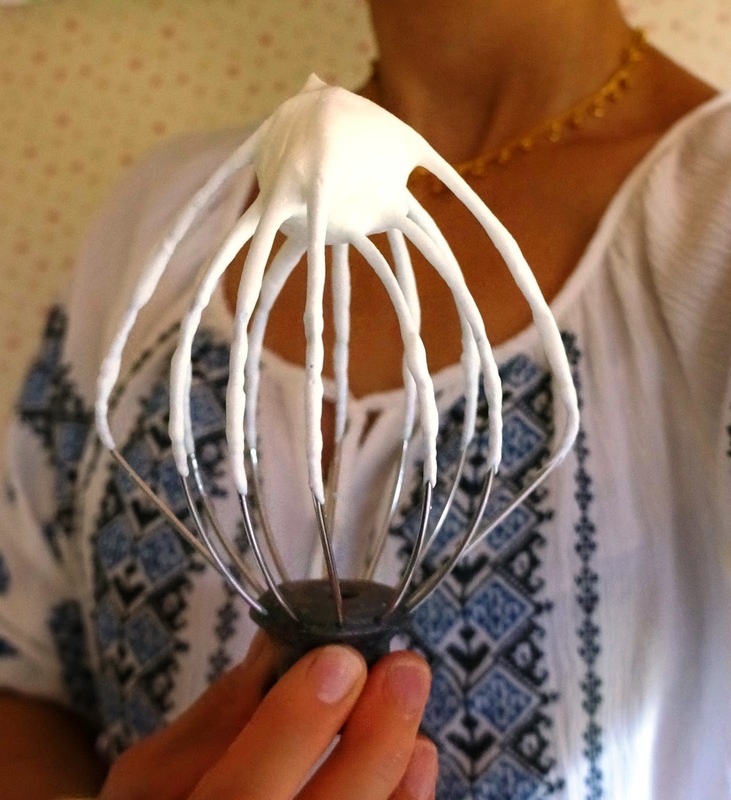 Spoon dollops of the whipped cream over it and spread to create a wavy pattern. Sprinkle the remaining lemon zest over the whipped cream. Cover and transfer to fridge until ready to serve. Peaches and berries would be right at home here. Tuck them in between the layers, arrange them over the whipped cream on top or just offer them as a side. Celebrate the flavors of summer with this light and luscious treat. But, in case you end up hiding in the closet with the whole thing, do try to find a way to forgive yourself for not wanting to share. *Honey, I assure you there is no need to panic. No Veuve Clicquot or Moet was harmed in the making of this cake. Only several glasses of Sofia were sacrificed, but since the results were stellar, it was no loss in the end. Hi Coco, this cake looks so decadent. So nice of you to call your parents everyday, your mom sounds like a great cook. Great presentation too, did you just change your site a little? Colette, looks like a very light and elegant cake – perfect for this time of year! I certainly would not mind enjoying a nice slice with my coffee right now! Have a great week – hope you are taking good care of yourself! Decadent is the perfect word for it. Yes, Cheri. You have a good eye. I revamped my header and added a few little bees. Thanks for noticing! Andrea doll, I can just imagine what it would look like if you made it. You're so talented! One day, we will enjoy one together, over coffee and chat. You are so talented. I can see that you have baked this beautiful so easily with no prior practice and testing. Your guests must be very impressive with this cake that you baked. Coco, this looks and sounds amazing! I'll have to try this one weekend! Too funny about Shawn going for an extra long bike ride! Ok, too funny Michael bikes too, although he mostly likes mountain biking, he does bike into Bart almost 4 days a week. Ok, have a wonderful weekend! J PS great posts!!! Sounds like our hubbies might qualify as BFFs some day! Hope you're enjoying your holiday. Can't wait to hear all about it when you get back.